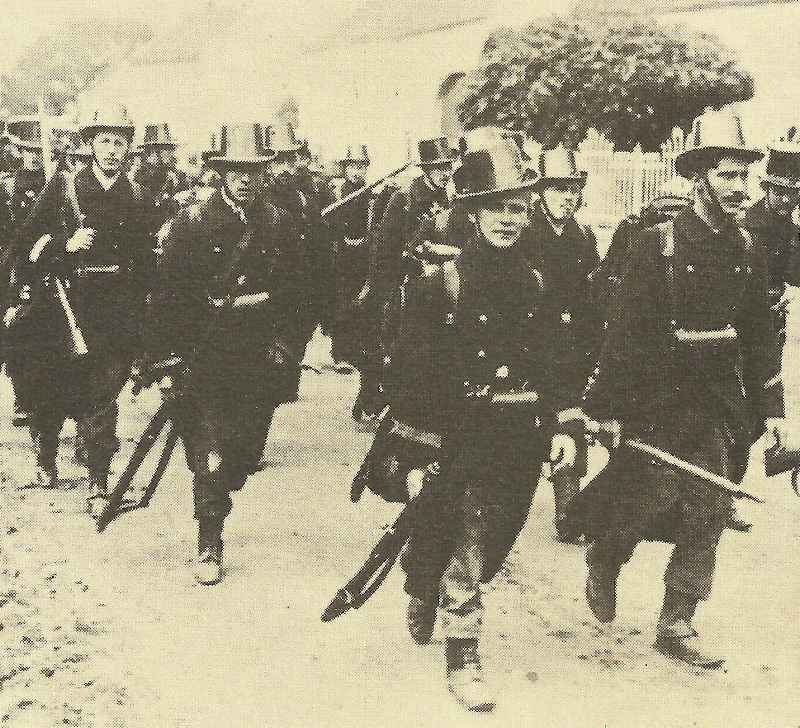 Troops of Belgium’s neglected and poorly trained army on the way to the front. The government declares war at 2300 hours as the Germans reject the British ultimatum requesting that their troops leave Belgian soil. Army Reserves and Territorial troops mobilized. Government commanding railways. H.G. Wells press article identifies enemy as ‘German imperialism and militarism’. Sir E. Goschen’s ‘scrap of paper’ interview with German chancellor Bethmann about Belgium. The government declares war on Belgium and its armies invade in force across a narrow front. Leading the main attack are the First Army com­manded by General Alexander von Kluck and General Karl von Büllow’s Second Army. Bethmann tells Reichstag ‘Necessity knows no law’; 5 billions Reichsmark war spending authorized; Bundesrat empowered to legislate without Reichstag’s consent. Kaiser receives Reichstag ‘Henceforth I know no parties, only Germans’. GERMANS INVADE BELGIUM ON 15­-MILE FRONT AND ATTACK LIEGE (fortress on river Meuse). German cavalry take Vise 8 miles north of the city and ford river Meuse north and south of the city. Moltke peremptorily rejects offer by German Admiralty Staff to intercept BEF’s cross-Channel transportation: ‘.. this is not necessary, and it will even be of advantage if the Armies of the West can settle with the 160,000 English (ie est strength of BEF) at the same time as the French and Belgians.’ Belgian field army concentrates behind river Gete, 36 miles west of Liege. Germans deploy opposite. The government declares its neutrality. Cabinet decides on strict neutrality. The two German warships, the battlecruiser ‘Goeben’ and the light cruiser ‘Breslau’, under the command of Vice Admiral Wilhelm von Souchon, open fire on Bone and Philippeville, two ports in French Algeria, for 10 minutes. After the attack Souchon heads for Turkey. As he sails east across the Mediterranean, his small squadron runs into two British battlecruisers, the ‘Indefatigable’ and ‘Indomitable’, sailing west. The British commander, Vice Admiral Sir A. Berkeley-Milne, refrains from opening fire as the British govern­ment’s ultimatum demanding that German forces inside Belgium should withdraw or face war does not expire until midnight. Souchon also avoids action and continues on to Turkey. Admiral Jellicoe succeeds Callaghan in command of reinforced British Home or First Fleet, desig­nated C-in-C Grand Fleet; hoists flag in ‘Iron Duke’. Fleet leaves Scapa Flow on first sweep at 0830 hours to prevent German raiders breaking out. German East Asiatic Squadron (Spee) leaves Tsingtao (China) for South America. Enver Pasha implies Dardanelles open to German warships, Grand Vizier disagrees. 2 French battalions evacuating besieged Fort Khenifra and lose 66 casualties to Zaians of Middle Atlas.